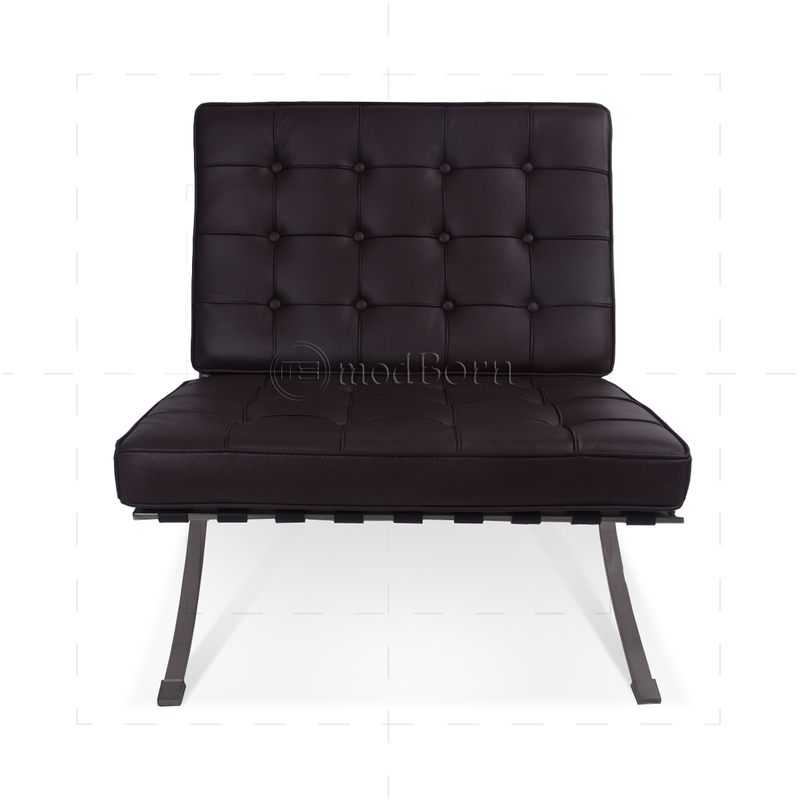 If you think your bum is worthy of a seat fit for a king, you might consider parking it in the luxurious ‘’Barcelona Chair’’. 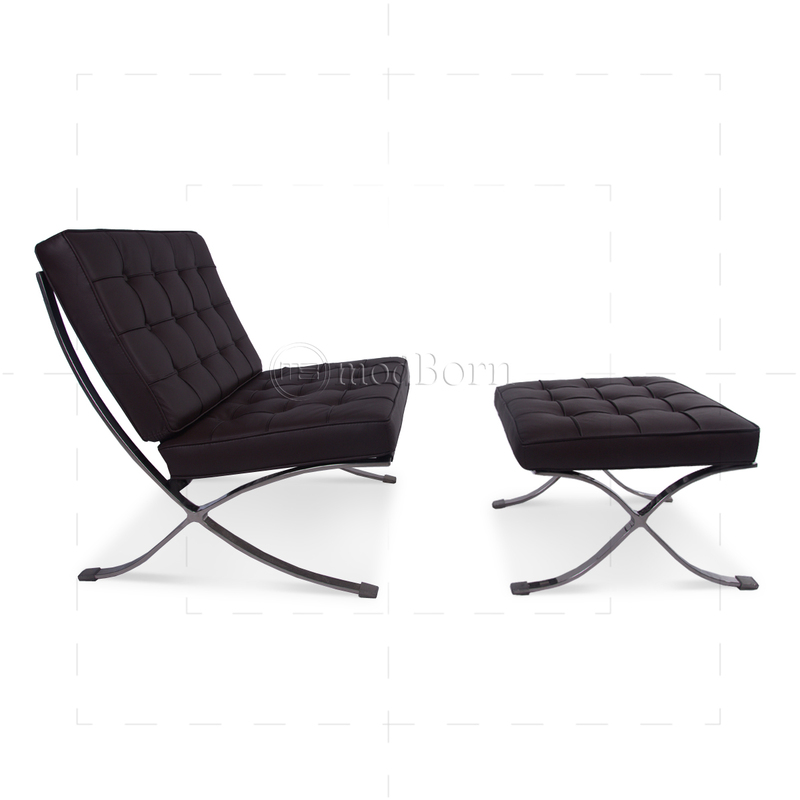 Barcelona chair timeless shape and supreme comfort has made it a modern classic design. 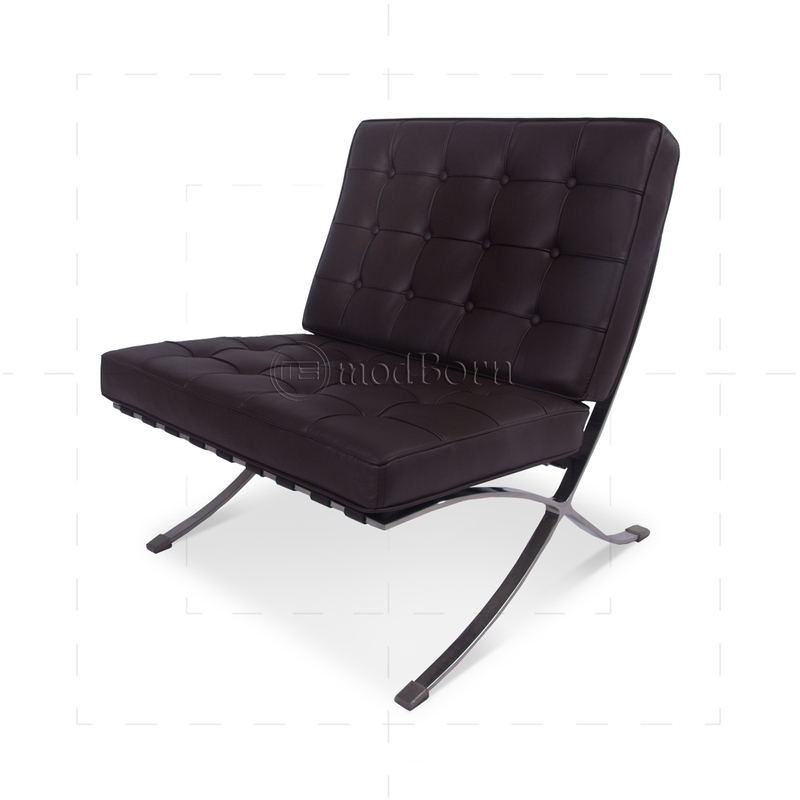 The Barcelona chair brown is one of the most definite pieces of modern furniture all over the world.With the fact that the design of the barcelona chair and ottoman has come along a long span of time, barcelona chair replica is admirable for the artisan to have thought about the wonderful sleek design. Ottoman is being sold separately. 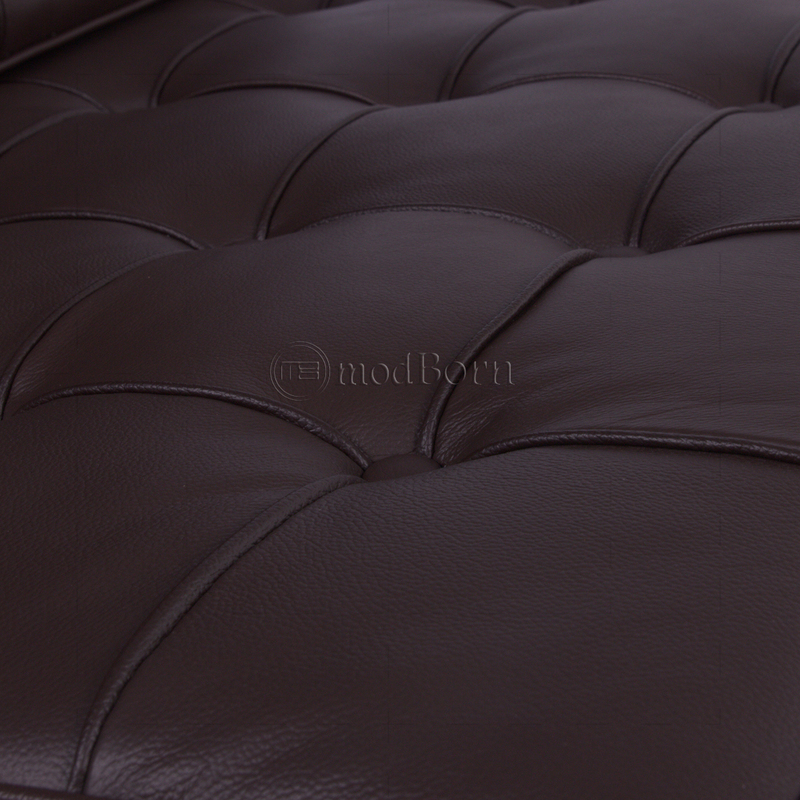 You will only find best and quality materials in our furniture. Strong support leather straps are built to last a lifetime and solidly riveted to the frame. Safety All of our furniture products fulfil the UK/Europe & USA fire safety standards. Ludwig Mies van der Rohe (born as Maria Ludwig Michael Mies; March 27, 1886, Aachen – August 19, 1969, Chicago) was a German-American architect. He is commonly referred to, and was addressed, as Mies, his surname. Along with Le Corbusier, Alvar Aalto and Frank Lloyd Wright, he is widely regarded as one of the pioneering masters of modern architecture. Mies, like many of his post-World War I contemporaries, sought to establish a new architectural style that could represent modern times just as Classical and Gothic did for their own eras. 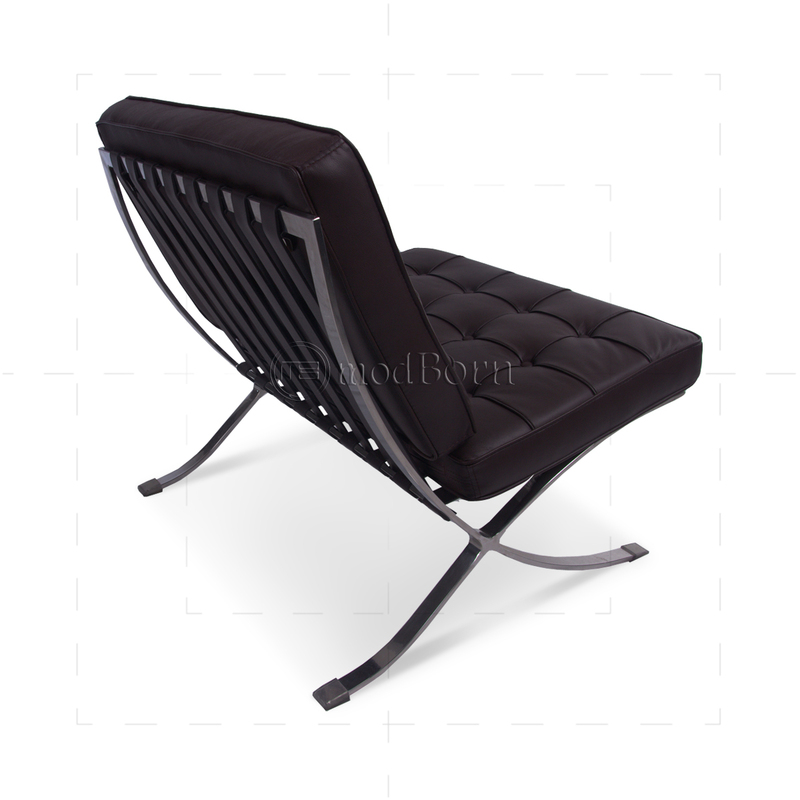 He created an influential twentieth century architectural style, stated with extreme clarity and simplicity. His mature buildings made use of modern materials such as industrial steel and plate glass to define interior spaces. He strived towards an architecture with a minimal framework of structural order balanced against the implied freedom of free-flowing open space. He called his buildings "skin and bones" architecture. He sought a rational approach that would guide the creative process of architectural design. He is often associated with the aphorisms "less is more" and "God is in the details". Mies worked in his father's stone-carving shop and at several local design firms before he moved to Berlin, where he joined the office of interior designer Bruno Paul. He began his architectural career as an apprentice at the studio of Peter Behrens from 1908 to 1912, where he was exposed to the current design theories and to progressive German culture, working alongside Walter Gropius and Le Corbusier, who were later also involved in the development of the Bauhaus. Mies served as construction manager of the Embassy of the German Empire in Saint Petersburg under Behrens. His talent was quickly recognized and he soon began independent commissions, despite his lack of a formal college-level education. A physically imposing, deliberative, and reticent man, Ludwig Mies renamed himself as part of his rapid transformation from a tradesman's son to an architect working with Berlin's cultural elite, adding "van der" and his mother's surname "Rohe", using the Dutch "van der", rather than the German form "von" which was legally restricted to those of genuine aristocratic lineage. He began his independent professional career designing upper-class homes, joining the movement seeking a return to the purity of early nineteenth century Germanic domestic styles. He admired the broad proportions, regularity of rhythmic elements, attention to the relationship of the man-made to nature, and compositions using simple cubic forms of the early nineteenth century Prussian Neo-Classical architect Karl Friedrich Schinkel. He rejected the eclectic and cluttered classical styles so common at the turn of the twentieth century as irrelevant to the modern times. After World War I, Mies began, while still designing traditional neoclassical homes, a parallel experimental effort. He joined his avant-garde peers in the long-running search for a new style that would be suitable for the modern industrial age. The weak points of traditional styles had been under attack by progressive theorists since the mid-nineteenth century, primarily for the contradictions of hiding modern construction technology with a facade of ornamented traditional styles. While continuing his traditional neoclassical design practice Mies began to develop visionary projects that, though mostly unbuilt, rocketed him to fame as an architect capable of giving form that was in harmony with the spirit of the emerging modern society. Boldly abandoning ornament altogether, Mies made a dramatic modernist debut with his stunning competition proposal for the faceted all-glass Friedrichstraße skyscraper in 1921, followed by a taller curved version in 1922 named the Glass Skyscraper. He continued with a series of pioneering projects, culminating in his two European masterworks: the temporary German Pavilion for the Barcelona exposition (often called the Barcelona Pavilion) in 1929 (a 1986 reconstruction is now built on the original site) and the elegant Villa Tugendhat in Brno, Czech Republic, completed in 1930. Mies designed modern furniture pieces using new industrial technologies that have become popular classics, such as the Barcelona chair and table, the Brno chair, and the Tugendhat chair. 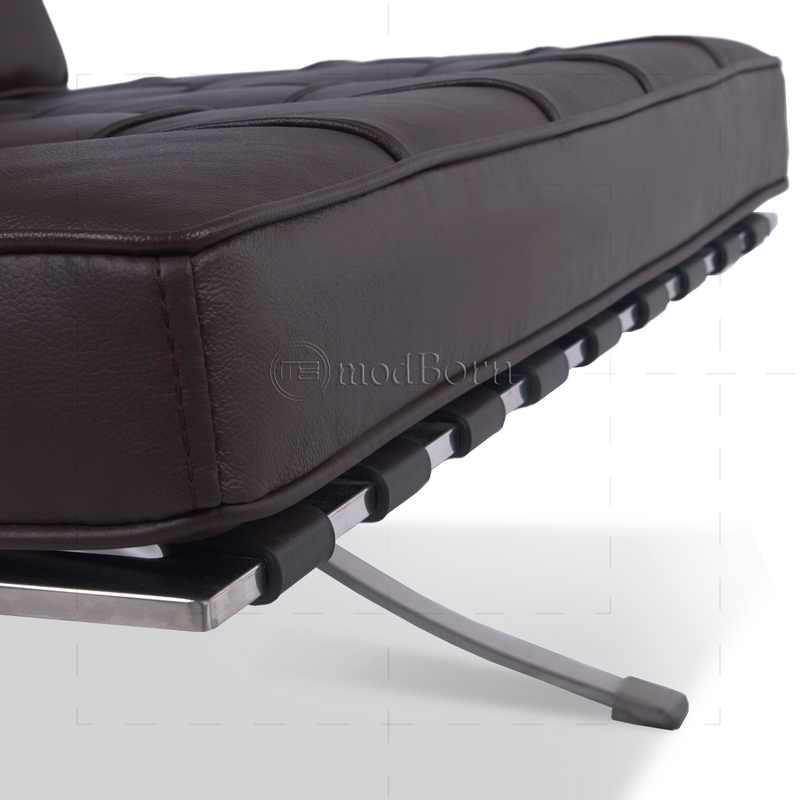 His furniture is known for fine craftsmanship, a mix of traditional luxurious fabrics like leather combined with modern chrome frames, and a distinct separation of the supporting structure and the supported surfaces, often employing cantilevers to enhance the feeling of lightness created by delicate structural frames. During this period, he collaborated closely with interior designer and companion Lilly Reich. Over the last twenty years of his life, Mies developed and built his vision of a monumental "skin and bones" architecture that reflected his goal to provide the individual a place to fulfill himself in the modern era. Mies sought to create free and open spaces, enclosed within a structural order with minimal presence. Mies van der Rohe died on August 17, 1969. After cremation, his ashes were buried near Chicago's other famous architects in Chicago's Graceland Cemetery. His grave is marked by a simple black slab of granite and a large Honey locust tree. © 2019, Modborn Furniture. All Rights Reserved.